Iceland Moss Alcohol-FREE Liquid Extract, Iceland Moss (Cetraria Islandica) Whole Plant Glycerite Features and description: ALCOHOL FREE! NON GMO! GLUTEN FREE! Expertly extracted Iceland Moss ALCOHOL-FREE liquid extract! Iceland Moss Glycerite con.. Immune Care NON-Alcohol Liquid Extract, Immune System Herbal Herbal Supplement Features and description: ALCOHOL FREE! NON GMO! GLUTEN FREE! Highest Strength Immune Care NON-Alcohol liquid extract! Immune Care NON-Alcohol l.. Immune Support Alcohol-FREE Herbal Liquid Extract, Eleuthero, Astragalus, Ashwagandha, Reishi, Echinacea, Myrrh Glycerite Features and description: ALCOHOL FREE! NON GMO! GLUTEN FREE! 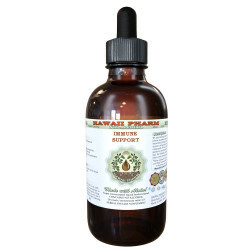 Highest Strength Immune Support NON-Alcoh..
Inchplant Liquid Extract, Dried herb (Tradescantia Zebrina) Alcohol-Free Glycerite Features and description: NON GMO! Gluten Free! We made this Inchplant liquid extract using ONLY natural ingredients! This extract does not contain Alcohol, GMO, g..
Indian Madder Liquid Extract, Dried root (Rubia Cordifolia) Alcohol-Free Glycerite Features and description: NON GMO! Gluten Free! We made this Indian Madder liquid extract using ONLY natural ingredients! This extract does not contain Alcohol, GM..
Indian Mallow Liquid Extract, Dried seed (Abutilon Indicum) Alcohol-Free Glycerite Features and description: NON GMO! Gluten Free! We made this Indian Mallow liquid extract using ONLY natural ingredients! This extract does not contain Alcohol, GM..
Indigo Liquid Extract, Dried leaf (Isatis Tinctoria) Alcohol-Free Glycerite Features and description: NON GMO! Gluten Free! We made this Indigo liquid extract using ONLY natural ingredients! This extract does not contain Alcohol, GMO, gluten, art..
Iphigenia Liquid Extract, Dried rhizome (Iphigenia Indica) Alcohol-Free Glycerite Features and description: NON GMO! Gluten Free! We made this Iphigenia liquid extract using ONLY natural ingredients! This extract does not contain Alcohol, GMO, gl..
Irish Moss Alcohol-FREE Liquid Extract, Irish Moss (Chondrus Crispus) Powderer and Dried Glycerite Features and description: ALCOHOL FREE! NON GMO! GLUTEN FREE! Expertly extracted Irish Moss ALCOHOL-FREE liquid extract! Irish Moss Glycerite conta..